Inspired by the Book of Changes (Yi jing), the name of this hall signified that unions of the celestial and the terrestrial, of Yin and Yang, and of upper and lower, can generate harmony and peace on which everything depends to develop smoothly. 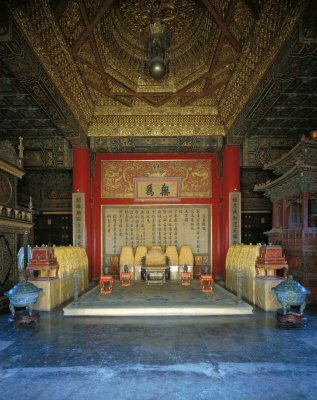 Introduced in the Jiajing reign (1522-1566) between the Palace of Heavenly Purity (Qianqing gong) and the Palace of Earthly Tranquility (Kunning gong), the Hall of Union (Jiaotai dian) follows the Hall of Central Harmony (Zhonghe dian) in architectural design. It was the place for the "empress” to receive greetings from her high-ranking subjects on major festivals. In 1748, the Qianlong Emperor (r. 1736-1795), placed the twenty-five imperial seals that represented imperial authority in this hall. The mechanical striking clock and the copper clepsydra (a water clock) installed in the hall set the standard for all the timepieces inside the Forbidden City. A signboard inscribed with the philosophical maxim "Non-interference” (Wu wei) is hung above the throne. 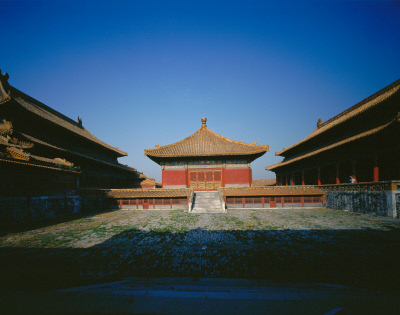 The Shunzhi Emperor (r. 1644-1661) placed an iron signboard in this hall with a strong admonishment: "Eunuchs are forbidden to interfere with political affairs”.